There is a wide range of UNESCO World Heritage Sites in China. As of 2018, there are 53 sites included in the list. This is one of the most famous attractions on this list of UNESCO World Heritage Sites in China. The Forbidden City is an Imperial Palace in the heart of Beijing. It served as the official palace in Beijing from the Ming to the Qing dynasty – from 1420 to 1912. The other half of this UNESCO site is the Mukden Palace. This served as the Imperial Palace in China during the Qing Dynasty. Three Qing emperors lived in this palace. This is a cultural site that was added into the UNESCO World Heritage Sites in China in 1987. It took 38 years to construct this mausoleum, which is located beneath a 76-meter tomb mound that looks like a truncated pyramid. The main component of the architectural complex is the main tomb chamber wherein the coffin and burial artifacts are housed. This is another cultural site in China noted for its contribution to the religious and cultural location within the Silk Road. The term Mogao Caves is a collective name used to refer to the Buddhist cave sites within the area. Within these caves, you will find the purest examples of Buddhist art that dates back to about 1,000 years ago. Evidence shows that these caves were used as place of worship and meditation in 366 AD. Officially known as Mount Taishan, this is categorized as a mixed site under the list of UNESCO World Heritage Sites in China. It is the eastern mountain among the Five Great Mountains of China. The Chinese associated this mountain with sunrise, birth, and renewal. It is also considered as an important place of worship for about 3,000 years ago. This Pleistocene hominid site is located within the North China Plain in the Yanshan Mountains. During the earlier times, there was an adequate supply of water and natural limestone caves that was crucial to the survival of humans who lived here in earlier times. Various animals and human fossils were discovered by scientists on the site. This is another icon in China. The Great Wall of China is a series of fortifications made from a wide range of materials including bricks, stones, tamped earth, and wood, among other things. The wall was built with the intent to protect China from invasions from the nomadic groups. The walls were built during the 7th century BCE. This mountain range is located in the Anhui province of China. This is a notable cultural and natural site in China, therefore earning its spot in the UNESCO World Heritage Sites in China. It is best known as the home of Huangshan pine trees, winter snow, hot springs and sunsets. In fact, it is a subject of many traditional Chinese paintings and literature. This natural site has made it to the list because of its superlative natural beauty. From the snow-capped mountain peaks, to Chinese glaciers, to spectacular limestone formations and hot springs. This area also features a diverse forest ecosystem that is home to several endangered plants and animals. This site was added to the list of UNESCO World Heritage Sites in China in 1992. This remote region is also a World Biosphere Reserve (inscribed in 1997). This valley belongs to the Min Mountains along the edge of Tibetan Plateau and is known for its multi-level waterfalls, snow-capped peaks, and colorful lakes. Located in the Hunan Province of China, the Wulingyuan Scenic and Historic Area is filled with over 3,000 sandstone pillars and peaks. There is also a huge diversity when it comes to the landscape of the area with some parts filled with gorges and streams while other parts feature many waterfalls. There are also approximately 40 caves in the area and natural bridges. Several species of plants and animals call this their home. This served as the winter palace of Dalai Lama during the 7th century. The palace is believed to be a symbol of Tibetan Buddhism and its important role during the Tibetan administration in China. The palace complex consists of the White and Red Palaces together with its ancillary buildings. The palace is constructed atop the Red Mountain. This Taoist shrine is part of the Hubei Province in China renowned for its magnificent building complex ancient design and surrounding natural landscape. This mountain is also notable as being the birthplace of the Wudang Martial Arts in China. It was added to the list of UNESCO World Heritage Sites in China in 1994. This is known as the summer palace by the Qing Dynasty. The palace is located in Hebei Province wherein constructed started in 1703 and was completed in 1792. The temple is actually a complex of several structures including palaces and ceremonial buildings. The temples also feature a wide range of architectural styles that blend with the natural landscape around it. Confucius is one of the most important historical figures to come from China. Hence, the Temple of Confucius being named as one of the UNESCO World Heritage Sites in China is not surprising. Aside from the Temple of Confucius, there are two other sites included in the list: the Cemetery of Confucius and the Kong Family Mansion. The mansion served as residence for the main-line descendants of Confucius. This is another mixed category site in China. Naturally speaking, Mount Emei is important to China because of the high level of endemism with more than 200 endemic plant species found in the area. Meanwhile, it is also a vital part of the Chinese culture as Mount Emei is considered as one of the Four Sacred Buddhist Mountains of China. It is regarded as a place of enlightenment by the Buddhist worshippers. Lushan National Park is another natural site noted for its spiritual importance to the Chinese civilization. The strikingly beautiful landscape is also home to Buddhist and Taoist temples. In addition to these temples, over 200 historic buildings can be found in the Lushan National Park area. This ancient city is located in the province of Shanxi in China. It served as the financial center of China during the Qing dynasty. This ancient city has a history of over 2,000 years and is best known for the city walls that had been preserved until today. This UNESCO World Heritage Site is a collection of gardens within Suzhou in the province of Jiangsu. These gardens have been around for more than 1,000 years! In fact, some of them were built by the scholars and were designed according to the standard of classical Chinese gardens. The showcase of aesthetics that is representative of the Chinese culture has helped it earn a spot in the list of UNESCO World Heritage Sites in China. With more than 1,000 years in history, this old town was added to the ist of UNESCO World Heritage Sites in China for its cultural value. It played an important role during the trade activity at the Old Tea Horse Caravan Trail. But it is also most notable for its orderly waterway and bridge system, although it is now fast becoming an old memory as they have been replaced with underground water systems due to the growth and development in suburban areas. The Summer Palace is a tourist destination and recreational park in China consisting of lakes, gardens and palaces. It is located in Beijing, China. The main features of the Summer Palace include the Longevity Hill (that rises up to 60 meters in height) and the Kunming Lake. The combination of the open water and hill landscape offer a beautiful contrast to the pavilions, palaces, temples and bridges found within the park. This is another UNESCO World Heritage Site located in Beijing, China. This is an Imperial Complex consisting of religious buildings such as the Hall of Prayer for Good Harvests, The Imperial Vault of Heaven and the Circular Mount Altar. This complex is therefore an important site for ceremonies and worship in China. This is another cultural site in China inscribed into the UNESCO list in 1999. This series of rock carvings depict religious sculptures that Archaeologists believe to have been created sometime in the 7th century AD. These sculptures and carvings are associated with Taoist, Buddhist and Confucian beliefs. Mount Wuyi is listed as a mixed category UNESCO World Heritage Site due to its cultural, biodiversity and scenic importance to the region. The area spans over 99,000 hectares in size and is divided into four parts. The unique geological features consisting of large fault structures, high volcanic activity, river valleys and dome-shaped cliffs make it a unique natural landscape. But it is also an important biodiversity site since it is the purest example of a Chinese subtropical forest system. This is an important cultural site in China, which is what earned its spot in the list of UNESCO World Heritage Sites in China. These ancient villages showcase local-style residences wherein you will find over 100 ancient residences in the village, together with ancestral halls. All the streets are also paved with cobbles or black stones. There are several tombs and burial complexes that are included in this listing for UNESCO World Heritage Sites in China. These tombs span the Ming and Qing dynasties. The original listing was recognized in the year 2000, but more sites were included into the list in 2003 and 2004. The Longmen Grottoes, also known as Longmen Caves, is a cultural site inscribed into the UNESCO World Heritage Sites list in 2000. The images of Buddha and his disciples were carved out as rock reliefs and limestone cliffs. It is believed that there are up to 100,000 statues that were carved out from these caves. UNESCO noted the site as an important manifestation of ‘human artistic creativity’ in Chinese art form. The construction of this irrigation system started in the 3rd century BC. To this day, this irrigation system plays an important role in controlling the water from the Minjiang River and is distributed towards farmlands in Chengdu Plains. This region is important in China because this is the birthplace of Taoism. These grottoes are part of an ancient Chinese Buddhist temple that is believed to be the perfect example of rock-cut architecture. These grottoes are one of three most notable sculptural sites linked to Buddhism in China. The other two, Longmen Grottoes and Mogao Caves, are also UNESCO World Heritage Sites in China. This UNESCO site in Yunnan Province of China is of natural importance because it is unique to have three great rivers in Asia to run parallel to each other. Right after this area wherein there is a confluence between the rivers, they diverge wherein one empties into the Indian Ocean, another to the Mekong River, and the last one to the South China Sea. Koguryo used to be an ancient kingdom in Northeast China. It was included into the list of UNESCO World Heritage Sites in China in 2004 for its cultural value. The site is where you will find the archaeological remains of the fortress cities in the region along with the tombs of Goguryeo noble families during the Imperial period. 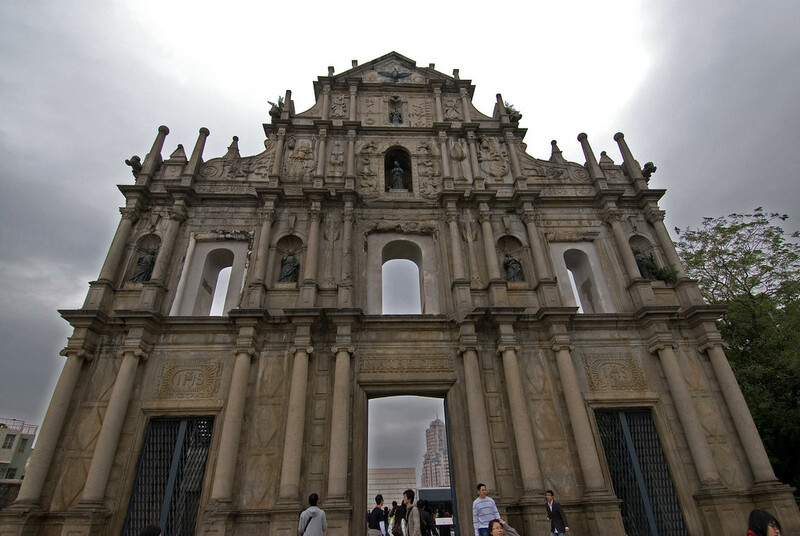 Macau is a famous tourist destination in China noted for its Portuguese influence. When you explore the historic centre of Macau, you will be able to witness the architectural legacy of the Portuguese colony to the city. From the monuments, to the temples, churches and squares, the city looks like the way it did during the time of Portuguese colonization. Inscribed into the UNESCO list in 2006, Yin Xu is an important cultural site in China due to the archaeological discoveries in the area. Oracle bones and oracle bone script was unearthed at the site that helped discover the earliest known Chinese writing. Yin Xu also represents the ancient city of Yin, which is considered as the capital of the Shang dynasty in China. About 30% of the world’s endangered giant panda species are found within this sanctuary in the Sichuan province of China. Hence, it was inscribed into the list of UNESCO World Heritage Sites in China for its natural value and to help in the preservation of these giant pandas. Located in Guangdong Province in China, this village features the Diaolou, which is a multi-story defensive village house. It is the purest example of the mixture of Chinese and Western architectural and structural concepts into one structure. These buildings serve three roles: communal towers that were used as a temporary refuge, residential towers, and watchtowers or fortified residences. This UNESCO site is of natural importance to China because of its rich biodiversity. The karst features and landscapes are also beyond anything that you would ever find in China or anywhere else in the world. For this reason, these karst formations were included into the UNESCO list in 2007 with expansions in 2014. This is another cultural site in the list of UNESCO World Heritage Sites in China. These are also known as Fujian earthen dwellings, which depict rural dwellings in China that is unique to the Hakka that dwell in the mountainous areas of Fujian province. These dwellings were built sometime between the 12th or 20th centuries. Sanqingshan is a natural park in China recognized into the UNESCO World Heritage Sites list in 2008. Mount Sanqing is the main feature in the park, which also serves as a natural shelter for animals and various plant species. In fact, there are more than 2300 plant species and 400 vertebrae species in this park. It is also famous for the three main summits in the park (known as Three Pure Ones): Yujing, Yushui, and Yuhua. This is inscribed under the mixed category by UNESCO for its cultural and natural importance in China. The Wutai Mountain is considered a sacred site by the Buddhist. At the same time, it also features an astounding natural feature wherein the mountain is surrounded by flat-top peaks and the river Qingshui. Mount Wutai is also home to 53 sacred monasteries and temples in China. The city of Dengfeng is located at the foot of what is considered to be the most sacred mountain in China: Mount Songshang. Within this city, you will find a cluster of historic buildings and sites including the Han Que gates (all three of them), Zhougong Sundial Platform, Dengfeng Observatory, and temples. These structures and buildings were constructed over nine dynasties in China and a reflection of how the Chinese perceive the power of the mountain, heaven, and earth. This landform in China is added into the UNESCO World Heritage Sites list for its natural value. It is a unique type of landscape characterized by steep cliffs and red sandstone formations that were formed through endogenous and exogenous forces. This landscape comprises the West Lake and the three hills surrounding it. It was inscribed into the list of UNESCO World Heritage Sites in China in 2011 as the area is used as a point of inspiration for artists, poets and other scholars since the 9th century. The lake has also been a point of inspiration for many Chinese garden designs for centuries as it reflects the “idealized fusion of human and nature”. The Site of Xanadu is located north of the Great Wall of China. It is of cultural importance to China since this is where the legendary Kublai Khan’s capital city remains are located. The site also shows evidence of the attempt to assimilate Han Chinese cultures with that of nomadic Mongolians. The site was also established in by the principals of Chinese feng shui. The Chengjiang Fossil Site, also known as the Maotianshan Shales, is a series of Cambrian deposits that are recognized as culturally important for their preservation of fossilized organisms. The site was named after the Maotianshan Hill in Yunnan Province of China. The fossils on the site date to as far back as 515 million years ago. This natural site was added to the UNESCO list in 2013 due to the fact that these mountain ranges hold some important forests in the region. In addition, the lower slopes of the mountain feature a unique natural forest that produces wild fruits such as apples and walnuts. In the Southern Yunnan Province of China lies the spectacular rice terraces built around the slopes of Ailao Mountains. The Hani people constructed these rice terraces over 1,300 years while developing a complex system of channels to bring irrigation to these rice terraces. In addition to rice farming, the Hani people also has an extensive farming system of cattle, ducks, cows, and fish, among others. This ancient Silk Road is an important part of the culture in China, as well as Tajikistan and Kazakhstan. The Silk Road is a 5,000-kilometer stretch that starts from Central China and ends in the Zhetsyu Region. The Grand Canal in China is the longest artificial canal in the world. It is also a famous tourist attraction in China. The canal starts off at Beijing and ends in Hangzhou. It was added to the list of UNESCO World Heritage Sites in China under the Cultural category in 2014. The Tusi Sites encompass the tribal domains that ruled the area during the 13th to early 20th century. The area covered under the UNESCO World Heritage Sites listing includes Laosicheng, Tangya, and Hailongtun Fortress. This historic rock art assembly painted on limestone cliffs in Guangxi, China is one of the most extensive ones you can find in the world. For this reason, it is considered of cultural value to China earning it a spot in the UNESCO World Heritage Sites list. These rock arts were painted onto these cliffs and caves over a hundred-year period, which depicts human figures, animals, and weapons. These rock art paintings, therefore, provide a glimpse into the life and rituals of the ancient Luo Yue people that lived on the site during the ancient times. The Shennongjia Forestry District in Hubei Province of China is an important natural site in China; hence, it was inscribed into the UNESCO list in 2016. The site is also listed under UNESCO’s World Biosphere Reserves, which speaks to its importance in terms of preserving the natural conditions and plant diversity within the forest. Chinese botanists claim there are nearly 3,500 plant species found within the area. There are also several protected animal species that call this region home, which includes the golden snub-nosed monkey. Kulangsu is a historic settlement in China, which is one of the newly inscribed UNESCO World Heritage Sites. It is located on an island near Chiu-Iung River where the interchange of cultural and architectural traditions between the Chinese, Southeast Asians and Europeans have occurred. This cultural exchange took place after the establishment of the commercial port in Xiamen in the mid-19th century. The foreign diplomats and missionaries were instrumental in introducing the culture and technology from the modern West to Asia. Qinghai Hoh Xil is an isolated region belonging to the Qinghai-Tibetan Plateau. This site was recognized by UNESCO as it is home to the largest and highest plateau in the world. The entire region spans 83,000 square kilometers in land area with an elevation of 4,800 meters above sea level. This area is also known for its volcanic origins; in fact, there are many volcanoes that are similar to the ones in Hawaii found within the area. In addition to its unique geological feature, Qinghai Hoh Xil is also home to many wildlife animal species. Some of these species are under the Chinese state protection.